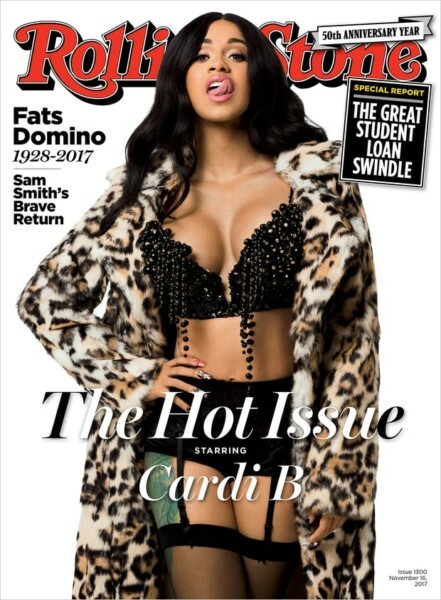 Cardi B is unrestrained in her interview with Rolling Stone, as she discusses everything from her relationship with Offset of Migos to her fear of being a one-hit wonder. Cardi B released her single “Bodak Yellow” in June, and in September it took the top spot of the Billboard Hot 100. It’s been up from there: her single was certified double platinum, she packed home a slew of awards at the BET Hip Hop Awards, and in October her man Offset proposed to her while she performed on stage. If you go broke and lose your career, it’s bad – and everybody is talkin’ s*** about it! At least if you lose your 9-to-5 you don’t got millions of people judging you and talking s*** while you lost your job. I got six, seven solid songs that I like, but I wonder if a month from now, I’m going to change my mind. It’s not as fun to do music. My mind doesn’t flow as free ’cause I have so much on my mind. Cardi B has come a long way. 7 years ago she was studying at a Manhattan community college planning to become a History teacher. She became an Instagram sensation, amassing over 100,000 followers, by making playful videos about scamming men. She’s always been open about her intention to marry him, and Offset proposed to her while they performed together at a concert in Philadelphia.